A mother drowned her three-year-old daughter in a bath a month after separating from her husband, whom she believed was having an affair, a court has heard. Bethan Colebourn was found dead at the family home in Fordingbridge, Hampshire, in October 2017. Claire Colebourn, 36, had searched for websites about suicide and drowning before the death, Winchester Crown Court heard. Kerry Maylin, prosecuting, said Bethan was found lying on a wet bed at her home in Whitsbury Road on 19 October. Paramedics were unable to revive her. Ms Maylin said the cause of death was not certain but was "very likely to be immersion in water", according to a pathologist. 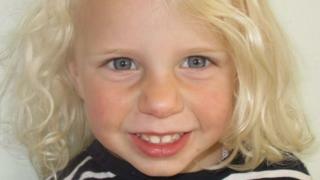 "Bethan had been put in the bath at home and held under the water," Ms Maylin told the jury. "That act was completed by her mother." Ms Maylin said the defendant had an "unfounded" belief that her husband Michael, a company chief executive, was having an affair with his financial director at their marine interiors firm Trimline. She met the firm's chairman to express her concerns and told friends. The court was told of a Facebook post in which Ms Colebourn wrote: "Michael walked out on his family on 7 September and we haven't seen him since. Ms Colebourn also changed her wi-fi password because she thought her husband was monitoring her over the internet, the jury heard. The court was told Ms Colebourn was suffering from a diabetic episode when Bethan was found. She described to police how she took her daughter to the bathroom after setting an alarm for 03:00, jurors heard. Ms Colebourn told officers: "She woke up... she put her hands on my cheeks, told me she loved me and said 'I don't want a bath, mummy, I don't want a bath'." The jury heard she then drowned her daughter, telling police: "I wanted to fight myself but I couldn't. She didn't fight... She had complete trust in me." Ms Maylin said the defendant told friends she then tried to kill herself by hanging herself, stabbing herself in the stomach and taking a fatal overdose of insulin. Asked in a police interview why she had killed Bethan, the defendant replied: "Because I didn't want her to go anywhere near her father." Jurors heard the girl's body was found by Ms Colebourn's mother, Janet Fildew, who visited at 18:30 on 19 October. The defendant was in another bedroom and was found to have injected herself with 306 units of insulin that day - nearly 10 times her normal dose, the prosecutor said. In hospital, Ms Colebourn wrote a letter to a relative saying about Bethan: "In my eyes, I saved her", the court heard. Asked about the comment in a police interview, she replied: "I can't be a liar... I'm going to have to go against legal advice. "Bethan drowned because I was there. I held her under the water." Giving evidence, Mr Colebourn said his wife had filed for divorce, claiming he was not interested in bringing up Bethan, which he was "not happy with". He described how he had met his wife at university in 2001 but said their relationship deteriorated quickly after Bethan's birth and he decided to leave in September 2017. "The relationship wasn't working, there was a realisation that the best for both parties and for Bethan was to separate," he said. He told the court his wife had reluctantly allowed him to see their daughter alone a week before she died. Mr Colebourn said when he had returned his daughter "she kissed me and hugged me and went in, she was fine, she was happy". He told the court Mrs Colebourn became "obsessed" with his ex-partner who was his Facebook friend, causing him to close down his account. In cross-examination Mr Colebourn accepted his wife was "devoted" to their daughter.